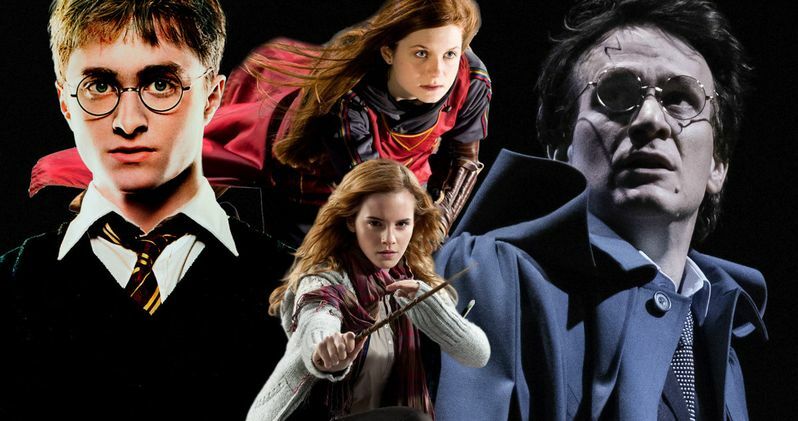 2016 was a great year for Harry Potter fans. Not only did the spinoff movie Fantastic Beasts and Where to Find Them allow them to return to the wizarding world, but J.K. Rowling also decided to continue the actual Harry Potter storyline with the stage play Harry Potter and the Cursed Child. Most fans haven't been able to see the actual play, but the transcript was made available for purchase and instantly became a bestseller. Now, some new rumors are swirling that Warner Bros. is hoping to turn the play into a movie trilogy in a few years. But J.K. Rowling continues to claim that isn't the case despite mounting evidence. Recently, journalist and historian Jim Hill guested on the Unofficial Universal Orlando Podast. On the show, he claimed that Warner Bros. was having conversations with Emma Watson, Rupert Grint and Daniel Radcliffe about possibly doing a Harry Potter and the Cursed Child movie trilogy after the Fantastic Beasts movies finish up. Author J.K. Rowling was fairly quick to extinguish those rumors on her Twitter account. Here is what she had to say about it. "I know a lot of people are looking for reasons to be cheerful today, but there is NO TRUTH to the rumour about a #CursedChild movie trilogy!" A lot of times, authors don't have a whole lot of control when a studio options the rights to their books, but that is not the case with J.K. Rowling. She has been heavily involved ever since the first Harry Potter movie and she even wrote the script for Fantastic Beasts and Where to Find Them. Warner Bros. doesn't do anything without her blessing and J.K. Rowling has said before that Harry Potter and the Cursed Child was always intended to be a play and not a movie. Even though she has shot it down, here is what Jim Hill, who says he has good contacts at Universal and Disney, claims is going on. ""I have heard that Warner Bros has actually had conversations with [Emma], with Rupert, and, of course, Daniel about Cursed Child, because they want this to be, for lack of a better term, Harry Potter: The Force Awakens. They want this trilogy of movies to have the actors that we know and love from the original films, that we watched grow up, as adults. And, of course, they're hiring a bunch of new, younger actors to play their children with the hope that, if we can lean on JK [Rowling], maybe there'll be The Cursed Adolescent." It's possible that J.K. Rowling is trying to protect Fantastic Beasts as a viable franchise for Warner Bros. at this current time, without thoughts of a new Harry Potter trilogy mudding things up. According to Jim Hill, his insider said that the Harry Potter and the Cursed Child movie wouldn't come out until 2026, which would reportedly be two years after the fifth and final movie in the Fantastic Beasts series. Harry Potter is 37 in the play and if the movie were to come out in 2026, Daniel Radcliffe would be of appropriate age, so it would make sense. But still, J.K. Rowling is the gatekeeper in this situation and she has made it clear there are no plans, at least that she knows of. It isn't hard to imagine that Warner Bros. would really want to turn Harry Potter and the Cursed Child into a movie, given the success of the play and considering that the Harry Potter franchise is one of the most successful of all-time at the box office. Aside from J.K. Rowling, Daniel Radcliffe has also made it seem like he probably wouldn't return to the role, but he won't rule it out entirely. Here is what he said in an interview with The Hollywood Reporter last year. "I'm never going to close the door, that would be a stupid thing to do. But I think I'll be happy enough and secure enough to let someone else play it. At the moment it's not even a concern because I'm too young to play the character, but even in 10 years' time, I would still feel strange about going back to it. There's a part of me that's like, some things are better left untouched. If we went back to Potter, there's a chance we'd make what Star Wars: The Force Awakens was to the original Star Wars, but there's also the chance that we'd make Phantom Menace. So I don't want to go back to anything like that and maybe sour what people have already loved." A lot can happen between now and 2026, but for now, Harry Potter fans need to take J.K. Rowling at her word and trust that Harry Potter and the Cursed Child will be a play and nothing more. Fortunately, the play is coming to Broadway in 2018, which will allow more fans to see it. Maybe Warner Bros. can gently twist J.K. Rowling's arm over the next few years and make it happen, but don't count on it.